The burning question when planning out your landscape is deciding between an outdoor fireplace or firepit. Both are great features to add to your landscape, but which one is best for you? The best way to decide is how you plan on using the feature, it is just for you and your family, or do you plan on having backyard barbeques to have multiple people enjoy it? There are differences between these two whether in looks, available space, and price. It is time to come to a decision for your backyard, and what you want it to look like. You should be aware of the size of your backyard and where you want the feature to be located. Once you know that, you can decide on which one will best fit that specific area. Both outdoor fireplaces and firepits are the perfect place for people to gather by in the summer. Both can accommodate smaller or larger backyards. They make a more elegant and pronounced architectural statement on your property. The smoke will go directly up the chimney and away from the people enjoying the warmth. Takes up less space on your patio, as it can be placed right on the edge. 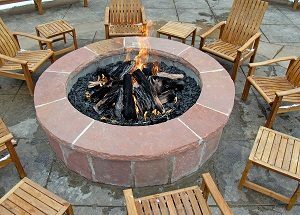 With a firepit you are able to go around the entire feature with everyone, people can pick up chairs and sit around the fire. You can also create a feature with hardscape to having seating around the firepit. Firepits are much smaller than fireplaces, making it so your view won’t get blocked. Now that you have an idea of which feature you will want to add, it is time to hire the professionals. When adding something like a fireplace or fire pit you should also consider creating a space where your guests can sit with hardscape. The best part of adding these features is being able to customize the area by having benches that go around the entire firepit. You also can choose between using gas or wood depending on your personal preference. Ready to start designing the backyard of your dreams? It is time to call the professionals at Greener Horizon. We can help with everything from the design process all the way to the finishing touches. In addition to our expert care and services, we also offer a free consultation to help you achieve the landscape of your dreams. Contact us today.